Imagine being taken to a camp by a family member, chained to a tree or a concrete structure, sometimes without cover, and forced to urinate, bathe, sleep, and defecate in the spot where you are chained. 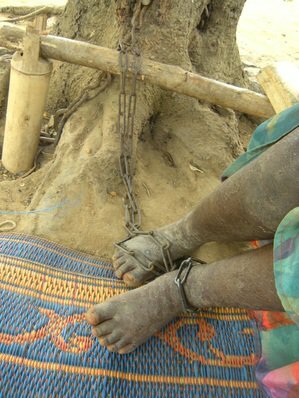 Imagine being shackled there for days at a time, deprived of food and even water, with no access to adequate health care and no real way of getting out. This is the reality for hundreds of people with real or perceived mental health conditions whom we met or saw in a number of prayer camps in Ghana. Ghana has several hundred prayer camps, which are believed to have emerged in the 1920s, although little is known about their history, numbers, or operations since they are not state-regulated. While prayer camps in Ghana often serve as a refuge for people seeking spiritual healing and peace of mind - for example, for people who may have a terminal illness or lost their job – some of these camps place people with mental disabilities in an inhumane and degrading environment. To my mind, chaining someone to a tree is not the kind of refuge anyone would seek. Victoria is a 10-year-old girl with a mental disability who was put in Nyakumasi Prayer Camp, where she was chained to a tree all day and slept on a mat in an open compound. In fact, the World Health Organization estimates that one in four people in the world will be affected by mental health or neurological conditions at some point in their lives. In 2011 and 2012, Human Rights Watch visited eight prayer camps in the Greater Accra, Central, and Eastern Regions, interviewing more than 50 people. We met Aisha, a woman in her mid-50s, in the Mount Horeb Prayer Camp in the Eastern Region of Ghana. She was only allowed to bathe twice a week and had to defecate in a bucket in a room full of other women. She told me that she would have preferred treatment in a psychiatric hospital, but camp administrators refused to let her leave. Ghana’s 2012 Mental Health Act creates a system through which people with disabilities can challenge their detention in psychiatric hospitals. However, the law does not apply to prayer camps, leaving people with mental disabilities without legal remedies to seek release. In most prayer camps, people with real or perceived mental disabilities may only leave when the prophet deems them healed. Prayer camps are run by privately-owned Christian religious institutions with roots in the evangelical or Pentecostal denominations. Any criticism of these camps is not linked to their religious roots or spiritual nature of the camps, as some such as Ambamfo Ofori Atiemo might believe. Rather, the critical issue is the inhumane treatment of people with mental disabilities forced to stay there. The United Nations expert on torture also observed extremely disturbing practices in the two prayer camps he visited. He documented cases of shackling and forced fasting for people with psychosocial disabilities or in some cases neurological problems, including children. He observed men, women and children in Edumfa Prayer Camp who were shackled to the walls or floors of their cells. The building holding adult males contained 16 concrete cells laid out like cattle stalls. There was a separate building for women and juveniles, with 10 people chained to the floor, including a 14-year-old girl and a 7-year-old boy, who exhibited symptoms not of a psychosocial disability, but of a neurological disease that required specialized treatment and medication. Inter-religious councils, faith-based organizations and the Ministry of Culture and Chieftaincy can play an important role in addressing these abuses in prayer camps. They should create guidelines to monitor operations of prayer camps affiliated with religious councils. They should also sensitize traditional healers and religious leaders on the manifestations of mental disability, and the rights of people with mental disabilities. The government of Ghana along with community leaders should lead the charge to ensure that no one with a disability is mistreated in any one of these prayer camps. It is not about religion. It is about humanity.